In honor of Elvis’ birthday yesterday, I made this pie. Very good, but very rich. Next time I make it, I will cut down on the sugar. To make the filling: In the bowl of an electric mixer fitted with the paddle attachment, cream together the peanut butter, cream cheese, sugar, and vanilla at medium speed. In a separate bowl, whip the cream until soft peaks form. Using a rubber spatula, fold the cream into the peanut butter mixture until completely combined. Scrape half the filling into the pie crust and smooth with a spatula. 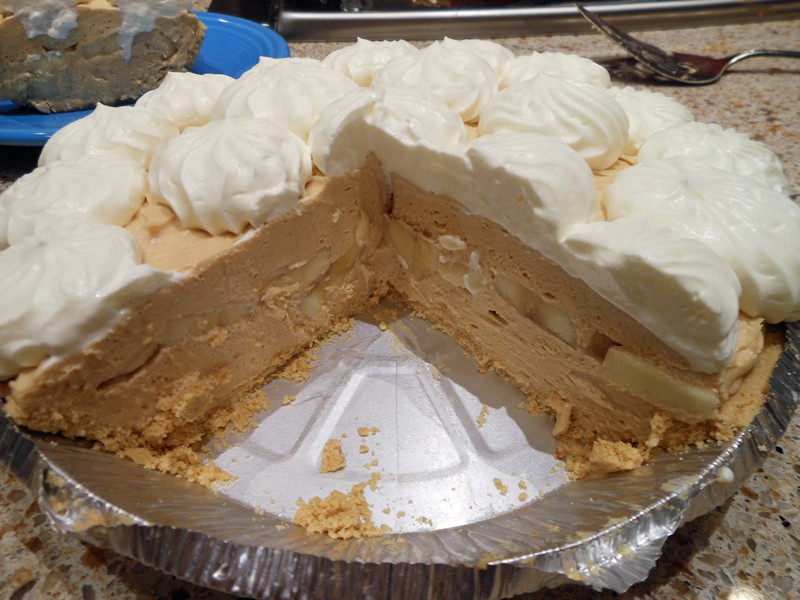 Layer the sliced bananas on top of the filling, then spread the remaining filling over the bananas. Cover with plastic wrap and refrigerate until set, at least 1 hour. To make the topping: In the bowl of an electric mixer fitted with the whisk attachment, whip the cream and sugar together until soft peaks form. Spread over the surface of the pie. Sprinkle the copped peanuts all over the top and serve to all your Elvis lovers out there.